Outdoor lighting helps enhance the exterior of your Weatherford house, as well as your yard, patio, garden, and pool area. It also provides you with greater security and a lower risk of falling or being injured while walking around your property at night. At Creative Nightscapes, we know that outdoor lighting doesn’t just have to be functional; it can also be installed merely to enhance the beauty of your property. Whether you have certain landscaping features that you would like to highlight or a patio that could use better lighting, our team can ensure that you end up with outdoor lighting that you’ll love. 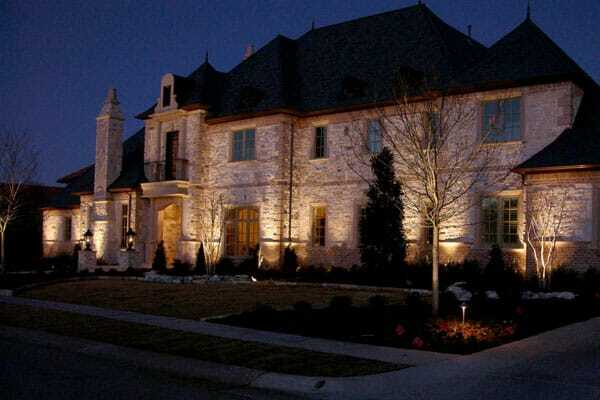 At Creative Nightscapes, we offer several outdoor lighting solutions for Weatherford homeowners. Having our outdoor lighting installed means that you can enjoy your yard more, even at night. Call us today for more information on our lighting options. 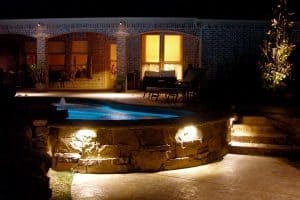 Creative Nightscapes in Weatherford is dedicated to offering outstanding outdoor lighting design and installation services. Our team uses only high-quality materials and takes many factors into consideration when designing an outdoor lighting plan for your Weatherford home. The team at Creative Nightscapes handles all aspects of your project from start to finish. We don’t use any subcontractors; our team takes care of each step to ensure that you have the results you want and that all of your outdoor lighting is set up and installed correctly. We can also help when your outdoor lighting needs maintenance in order to help you protect your investment. 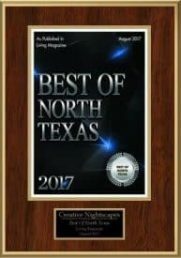 Creative Nightscapes has been proud to serve customers in the Dallas-Fort Worth Metroplex since 2004. For more than a decade, our team has been providing homeowners with the outdoor lighting they want. In that time, we have done more than 4,300 projects. Owner Patrick Cheatham is passionate about making sure that customers receive exceptional service and the ideal design plan for their outdoor lighting. Our company is also a proud supporter of non-profit organization Sower of Seeds Ministries. This organization is dedicated to providing children all over the world with a home, water, education, and food. Our commitment to exceptional service has been recognized and rewarded over the years. Awards and accolades that we’ve received include the Super Service Award from Angie’s List and Contractor of the Year from different lighting organizations. Those who call Weatherford home aren’t far from the larger cities of Fort Worth and Dallas. Residents can take I-30E for about 1 hour to reach Dallas, or drive for about 30 minutes on I-20E and I-30E to reach Fort Worth. Weatherford offers residents a number of places to go and things to see. One of the main attractions in town is Splash Kingdom Wild West, a family-friendly waterpark that features a Lazy River ride, a wave pool, and several water slides. The city also has local parks where residents can enjoy the outdoors. Holland Lake Park features a pond and historic log cabins, while the Town Creek Hike and Bike Trail provides a good way to explore the area. Other outdoor recreation includes a disc golf course and Noon Lions Ringer Alley for horseshoe enthusiasts. Residents can learn more about local history at Doss Heritage and Cultural Center, and see antique cars while having a bite to eat at Vintage Grill and Car Museum. Weatherford residents can help out the local community through volunteer opportunities with Clark Gardens, the local police departmenthttps://www.clarkgardens.org/support/volunteer.html, Freedom House of Parker County, and the Poverty Assistance Program. To learn more about our outdoor lighting design and installation services, contact Creative Nightscapes today at 817-581-6936. Our team is ready to help you create an outdoor lighting design that adds safety and beauty to your Weatherford home. Jerry and the team were fantastic! Lights look incredible and the service was great! Jerry and his well trained crews did everything they said they would, exactly when they were scheduled and at the agreed upon price. It was a pleasure working with everyone of his crew. . They gladly took the time to explain every step of their process so I completely understood.The completion was within the allotted time we had for them in our schedule. I would recommend them to anyone wanting a first class installation at a reasonable price. Installed Kichler LED lighting at home in Haciendas at Silverado. Placed up lights to accent columns, peaks of home, and trees. Mounted down lights to create moonlight effect and illuminate circle driveway, walkway, and yard. Set path lights and wash lights to highlight landscape greenery. Installed Kichler LED lighting at home in Silverado on the Brazos. Placed up lights to accent tree canopies, front entry, columns, Yucca Palm trees, and Holly trees. Set path lights to illuminate walkway, steps, and landscape greenery. Mounted and upgraded down lights illuminating BBQ grilling area, walkway, and seating area. Placed wash lights to accent landscaping, Yucca Palm and roses. Installed Kichler LED outdoor lighting at residence in Weatherford. Mounted down lights in trees creating moonlight effect and illuminating rock wall with tree carving, bench seat, patio deck, walkway, yard, and parking area. Placed up lights to accent tree canopies. Mounted hardscapes to illuminate setps and stone wall. Installed LED landscape lighting at home in North Star Crossing subdivision. Removed all builder lights on home and high voltage lighting in yard. Used up lights in front yard to accent facade of home, columns on either side of grand entry, and tree canopies. Performed annual maintenance for a residential client in Weatherford; replaced seven halogen bulbs, and cleaned all Garden Lights.